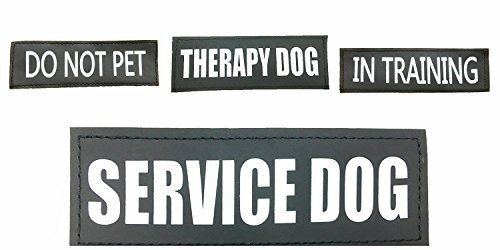 Size: -- Choose Size -- Large 6" x 2" Medium 5" x 1.5" Small 4.6" x 1" XXS or XS - 3.5" x 1"
Set of 2 Service Dog Reflective and Removable Hook and Loop Patches for XXS, XS - Sm - M - L- XL - XXL size Animal Vests and Harnesses. 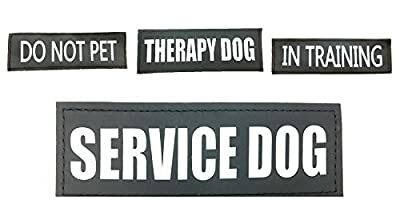 Our EMOTIONAL SUPPORT Patches with hook Backing allow you to change the identification of your service dog vest or harness in just a few minutes featuring large, reflective lettering that are recognizable even from a distance. Whether you have more than one service dog or your service dog has multiple jobs, the patches help to indicate its function or status at any time and in any location. You can easily convert a service dog vest to "IN TRAINING" - DO NOT PET- EMOTIONAL SUPPORT - THERAPY DOG, SERVICE DOG IN TRAINING, BEST FRIEND. Service animal vests ensure that the public sees your companion as a working dog and not just a family pet. It is essential that the vest reflect the functionality or the current status of a service dog wearing it by using the appropriate service dog patches. • Assistance from knowledgeable customer service professionals Working for more than 10Yr with pets, to answer your questions about Albcorp Service Dog Patches or even more. 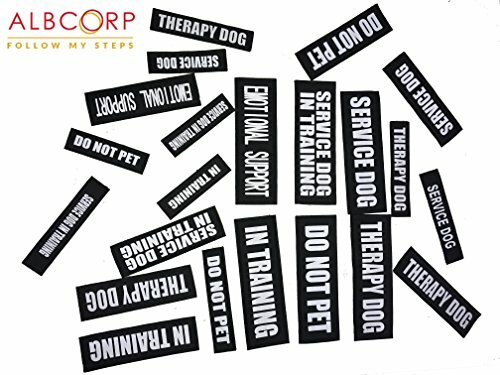 Albcorp Service Dog Patches are available in six designs: "SERVICE DOG", "DO NOT PET", "IN TRAINING" SERVICE DOG IN TRAINING, EMOTIONAL SUPPORT and "THERAPY DOG". Each service dog patch is constructed of durable polyester and has a Hook backing. It can be attached to any type of service dog vest that has Loop backing panel or sewn on to vests if there is no Hook attachment available. These patches make it easy to update your dog's status and help you save money by allowing you to use a single vest for multiple dogs. Contact US and we will make sure that you get the service you deserve!